No-name eBay Batteries – Too Good to be True? Probably. 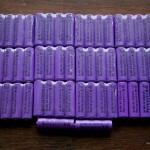 I recently gave a batch of batteries a punt on eBay. They were labelled as 3000mAh, and cost about €25 including shipping for 50. Now I realise that with current technology, it’s practically impossible to push the capacity of an AA form factor beyond 2500 mAh, but even if they came close to that, they’d still be pretty good value at 50c each. Even the deals in Aldi and Lidl usually work out at about €1 per cell. Anyway, a couple of weeks after purchasing on eBay, they duly arrived. The first thing that I noticed that they were far lighter than the 2300 mAh cells I normally use, which was not a good sign. Especially if they were actually NiMH, the same technology as I’m used to, they should be heaver if their capacity is greater. Anyway, I stuck on a dozen to charge. They charged quite quickly, another bad sign. If the cell charges quickly, then the charger has managed to put less energy into the cell. And the chargers I use are smart chargers, with deep-cycle, refresh, bad cell indicator, etc. With all these bad signs, I decided to discharge the cells and measure the voltage at regular intervals. A 500mA load over a few hours sounded like a reasonable test to me, so I got me a 2.4 volt, 0.5A bulb from and old torch I had lying around and hooked it up to two of the cells under test. Then I did something quite geeky. Over the next several hours I set a timer to go off every 15 minutes so I could measure the voltage across the terminals. This is the result, and the difference is quite startling. So, the 2300 mAh labelled battery versus the 3000 mAh labelled battery. Which is which? Well, the cheap eBay battery (labelled 3000 mAh) lasted just over an hour, at which stage the voltage took a nose-dive towards zero. 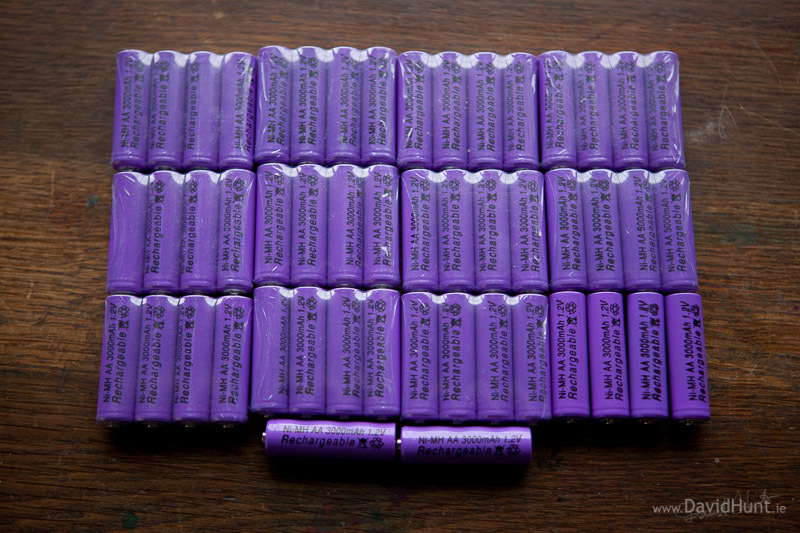 The Aldi “Activ” brand battery, which was labelled 2300 mAh kept going, and going and going. 4 hours later the graph started dipping, and when it hit 1.99 volts I gave up. I had the data I needed, and the graph says it all. If the Aldi battery is really 2300 mAh, and not some kind of 12000 mAh super-battery, then all I can assume after that is that the labelling on the eBay battery is a mistake. Or maybe just downright dishonest. I suspect the latter. From the above graph, it looks like the eBay battery is actually 1/4 of the 2300 mAh batteries capacity, or approximately 600mAh, which is only 20% of the labelled capacity. NOT EVEN CLOSE to the labelled capacity. I’m wondering what the eBay seller who sold me these pieces of crap will say when I ask for my money back. Probably nothing. They’re probably used to that question. I’ve had a few e-mails with the seller. I initially said to the seller that the items were not as described, then I pointed them at the graph above. They offered to refund $10 (€7) of the price to compensate me for my trouble. I said that I would not be happy with anything less than a full refund. They can refund me the full price, at which time I will consider giving positive feedback. They don’t refund me, and I will leave negative feedback and open a case with eBay. The next mail agreed to the first option. And I can tell you that the feedback will be marked as positive, but only because they refunded me. 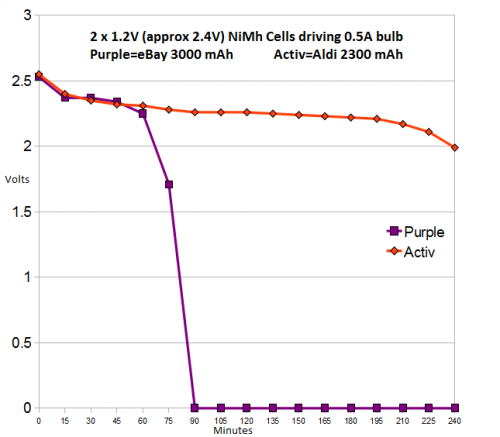 The comment will contain information that the 3000mAh cells were measured at 600mAh. So, I’m getting my money back. So all ends well. Now I’ve got to decide whether to actually put the batteries to use in something like remote controls, or just dump them. At about 600 mAh they’re really only good for recycling. Ya. In the trash they go. Good article Dave. I’m guessing the seller wasn’t an Ebay Power Seller, or does that even mean anything anymore.